New Census numbers show population growth rates within downtown areas. (CNN) - Singer Petula Clark once raved about downtown as the place that took away loneliness and worries and made everyone happy. Downtown, everything's waiting for you"
Clark sang that ditty decades ago after which some American downtowns fell into gloom and doom. But Thursday, new census data showed that downtowns were officially back as happening places. In many American cities, people are moving back into downtowns, defined by the U.S. Census Bureau as within a two-mile radius of City Hall. Data from the 2010 census (PDF) said that 16 million people, or about 6% of America's 258 million metro-area population, were living in downtowns. Metro areas with 5 million or more people experienced double-digit population growth rates within their downtown areas, according to census numbers released Thursday. The Windy City topped the list. 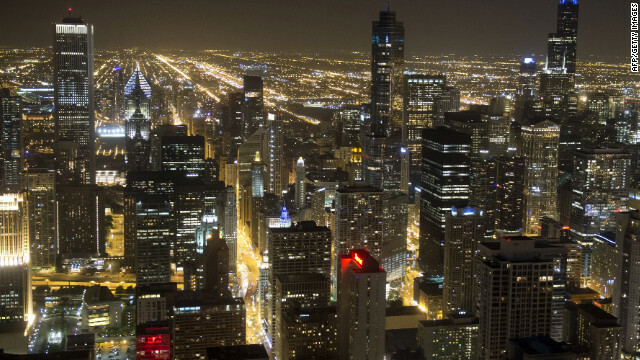 Downtown Chicago registered 48,000 new residents over 10 years. Also on the list were New York, Philadelphia, Salt Lake City and Washington. Demographers cite gentrification and people's a desire to live closer to their jobs as two main reasons for moving downtown. The largest declines over the decade were in New Orleans, which lost 35,000 people; Baltimore; and the Ohio cities of Dayton and Toledo, which lost more than 10,000. But the downtown population spurt doesn't mean the suburbs aren't thriving. The largest metro areas that reported the double-digit downtown spikes experienced similar growth in areas that were 30 miles out or beyond. More than one in 10 U.S. residents lived in either the New York or Los Angeles metro area in 2010. Although metro areas covered only slightly more than one-quarter of the nation's land area, they were home to eight of every 10 people. The Latino share of the population increased in every U.S. metro area. Metro-area residents were younger (a median of 36.6 years) than in less-populated areas (39.3 years). I love Chicago, that pic brings back memories. In most countries downtown areas are desirable places to live. The US destroyed its own downtowns by creating programs that concentrated the poor in those areas. This provided ghettos for the poor, and a disastrous image of decay that faced visitors from other countries. To recover, we need policies that support mixed income communities, where low income individuals can live in the suburbs and wealthy in the cities, without barriers of fear or income. Spreading service dollars and rent support outside the cities and providing realistic quality education that appeals to the better off inside will go a long way to helping our urban areas recover. I've actually been finding that only the wealthy can afford to live in downtown areas in any of the places I've looked. Houston, DC, NYC. It should be affordable for low and middle income people to live in the city, but it's not. We need to establish a Paddling Centre where the old Pavilion was. 2011 there are ceurrntly 19 teams (475 individuals) paddling on our portion of the lake and this is just dragonboating. We have a growing contigency of Outriggers, board paddlers, kayakers, canoeist who could all use a common center. The centre could be used by the public as a point for which any event is run. Sustainability and clean air is what we are all about and there is no better way to keep fit then out on our beautiful lake. These group sports bring our community together and the Paddling Centre will give them a place to grow and continue to contribute to a healthy community. Poor Baltimore. The city of baltimore has experienced steady – but SLOWING population decline. As a City Planner for the DC Area, AND a resident of the city of baltimore, I will say that the downtown population has actually INCREASED – to historic proportions. This is so negative, and typical of many newspapers, that assume Baltimore will always be behind every other city. It is NOT and should NOT be lumped into the rust belt cities. Its location is enough to be enviable by any of those cities listed. Its just not the same, despite its slowing decline. I lived in Atlanta suburbs for 30 years and honestly do not know anyone who work downtown. The jobs (at least jobs I work at) are all outside in the suburbs. The young, hip coworkers I know who lives downtown have horrendous commute every day. Sitting in one of the nation's worst traffic jams everyday just cannot be justified. Most of us choose to be dodgy and save ourselves some time and money. Downtown can be great while your job is there but remember that kids have no place to run or play there outside. It actually turns out that people who live in urban areas are thinner and healthier than those in the suburbs (once you adjust for race and ethnicity). We actually get most of our exercise from walking to the store and school and doing the daily activities of life. And, unfortunately, kids in the suburbs are as likely to sit all day in front of a video game as anyone. We need to provide not only the parks but the school options in the cities that will attract well off people and create mixed income communities, but if you look elsewhere in the world you'll find urban areas can be very healthy and desirable communities. We've just allowed our cities to decay by driving out the very people who could provide the tax base to keep them vibrant. This concept is OK, as long as the region of the country you are in doesn't have a very bitter divide between urban and rural population. Here in the midwest, there is extreme animosity between urban and suburban people, as well as between metropolitan and rural people. If that is the case, developing and living in "downtown lofts", in any town/city large or small, is to set ones-self up for public outrage, a "Not In My Backyard" backlash from locals, and become a smear target for the local press. "Downtown Loft" is an extremely dirty taboo word "around these here parts." in some areas. not just downtown, by establishing an "urban growth boundary" that stopped urban sprawl decades ago. People then had economic reason to fix up dilapidated neighborhoods that were way past their prime. It then made sense for local government to invest in mass transit like light rail, street cars, bike lanes and modern busses to service a thriving population. Portland's motto is "The City That Works", and it does. Come visit. Yeah, seriously... what the hell is with all the hipsters in the cities out west. Odd. Eastcoaster – it's not just the west coast cities (re hipsters) - Have you been through the revived meat packing district in Manhattan on a weekday night? Also I think this is a great option not for just the young but for middle aged professionals without children and retirees who want to live in smaller complicated lifestyle. If you are 70 years old and can't or don't want to drive and don't want a big house to maintain, buy a house Downtown and you can walk everywhere. Right now, I live about 30 minutes outside of a large metro area. I have every intention of moving to downtown when my daughter is grown, but until then, I prefer living in the country where she can play and roam. The deer and rabbits and turkeys roaming in the yard are a nice bonus, too. I know she would miss this area and don't want to force her to leave friends, so will stay put for now. But, I am looking forward to no longer having to commute, getting rid of my car, and walking where I need to go. The builders went overboard here with building high-rise condos and got stuck with whole buildings of units that they couldn't sell. They are going for dirt cheap now. I'm considering buying one to rent out until I get ready to move. Buy now because prices have already begun to bounce back and increase in my Downtown. In fact it is red hot with little or no inventory. Which downtown are you at? Young people like to live downtown until its time to start a family. Sure, a wealthy few can afford to live downtown and send their kids to private schools. The majority of sane people will still choose to live in safer, cleaner, less diverse environments. Downtowns are primarily young DINKS, gays, and retirees. "Less diverse environments". Racist much? Why does "diverse" have to mean race? It could mean income. Some people don't want to live and raise kids in an area with a homeless guy sleeping behind every dumpster. Let me remind you diversity is one of Americas strongest attributes. The fact that most people, excluding people such as yourself. See a person, not a minority or a majority. They see a friend, a neighbor or a co worked. The wording of your post is disturbing and it is exactly what is wrong with the GOP, Pro Gun, Anti Woman, Anti Black, Anti anything different then what they believe should be. The GOP party, that same party that embraces an organization that has put millions of guns on our streets and accepts the KKK and the Arian nation as member of their cause. How can you so casually make a statement. The fact that you can proves the marketing of hate has become the norm that people such as yourself dot event think about before they speak. Well think need to change. People bringing billions selling hate and weapons need to be stopped. Voting in yet another 4 years of this very type of hate and discrimination will lead exactly the same place the the Bush presidency did. War, death, economic melt down, or worse. Our founding fathers set this nation on the right track. I think they would be ashamed of how the GOP along with the NRA has used and distorted the right to own a gun. They would be appalled by the number of innocent people who have lost their lives so a few in big business can make a profit. The GOP is all for everyone owning a gun but if you get shot they want nothing to do with Healthcare and helping. Almost like an admission that if you get shot you must have had it coming. But they will say they are on your side. The GOP is on the side that is making money regardless of how it is made, War, Guns, Etc. All you have to do is look. A true American can see that is far far from a beneficial path for the USA to follow. But for most on the side of the GOP their arrogance come far above what is right and just for this country. What is Dink? Serious I don't know. I am bit oblivious when it comes to slurs? DINK is an acronym for "double income no kids", meaning a couple without kids. I live in LA, I prefer cities with better Metros but it's awesome place overall. They have really fixed up downtown LA, great place to live if you don't have dogs, there's literally no grass anywhere. Luckily all the other areas are a suburb/city mix with plenty of parks and yards. In the city where I live, people are living in downtown and driving on expressways to their jobs 20-30 miles outside the city center. It's a really interesting phenomenon, and perhaps it's not just about being close to work. Duane, the Free Trolley is popular and kinda cute but it is not a very efiecfint way to spend transit dollars. There are much better ways to use the money, ways that will have a greater impact on traffic congestion relief and would also encourage more people to use CTS. Park and ride stations in Greene or Southern Albemarle with reliable shuttle service to UVa for example. Also, most CTS service is very slow and unreliable. It doesn't even come close to providing a level of service that is good enough to get people to sacrifice the convenience of their cars. Just yesterday I spoke to a friend who is a captive of CTS. He is anxious to get a car because it took him an hour and half to get to Wal-Mart to buy some clothes. This can change. I also am bothered by the notion that using tax money to bring customers from one business district, The Corner, to the Downtown Mall is serving the public. Do you know how much the trolley costs to operate? Are you also aware that the ridership figures used by CTS are very misleading? Many of the trolley riders are actually UVa staff and students who could take a UVa shuttle but they get on the trolley because it just happens to show up a few minutes before the shuttle. Many of the other riders take the trolley instead of a regular route. I often see the trolley going down West Main with a load of a passenges and then several empty buses trailing it. The trolley actually poaches fare paying customers from the regular routes. This is not an efiecfint way to run a bus system. Unfortunately, it is very unlikely to change. I'm a 19 year old student living in Austin, TX. I absolutely love living in dense urban environments where I can walk/bike to different places. Hopefully my generation ditches the suburbs and continues this trend of downtown/urban living. They might ditch the 'burbs when they're nineteen, but when the kids start coming, things like sky-high rents and lousy urban school districts start counting big time. That's the cliche expectation, but the reality is people are not abandoning walkable / transit-oriented living when they have families, They may leave a bad school district or move to a satellite city that's more affordable, but the days of cul de sacs and McMansions are in the past. Thats the great thing about America – freedom of choice. Theres a place for people who want some land and a tool shed, a place to live in the country, a place to live in the burbs and place to live in the city. Theres a place thats right for everyone. A larger share just happen to be choosing the city over the burbs in these times, or at least trending that way. Choice is great, I agree. No place is perfect. I also agree that the current trend is toward the cities. As for the endlessly-praised "diversity" of urban areas, most people will find it overrated, if not an overall negative, if they're honest with themselves. At least that's the case here in NYC. Maybe there's another city out there waiting for me. I'm open. I hope they "ditch" suburb living as well. Then maybe everyone would recognize the problem of over population. Just because you can have a child does not mean you should. The church tell you that you should but once again they are going from texts that didn't have to worry about over population to the obscene extent we should be worrying about it. The Church and the GOP call it the family unit and how important it is to have. But then they start wars and send members of that family off to die in a fight they caused. I support the family and the military, what I do not support if the million or billions made by a few in government contracts. I don't support the people who want to have a family but ridicule and protest when the people that have just as much right to love some one as they do but because they are Gay and will not produce offspring un-exceptable. I can remember another song from that period – "Little Boxes." "Little boxes made of ticky tacky, and they all look just alike." It made the suburbs look like one big joke. It's so funny how liberals (like Pete Singer who sang "Little Boxes") love to complain about overpopulation, violence, wealth and materialism – but then choose to live in big cities like Manhattan which are the most overpopulated, violent, wealthy and materialism areas in the country! When the rubber hits the road, you'll find lots of them raising their families in nice, safe, orderly, "lily-white" areas. Oh, the horror. On another note, I wouldn't be surprised if this "urbanization" trend isn't being socially/economically/politically engineered. For Starters the Guys name was Pete Seeger not Singer.2nd your knowledge of American Metropolitan areas is weak at best.you mention New York city which though extremely crowded is one of the safest Metropolitan areas in the USA..cities like Dallas and Phoenix which are much smaller have more murders and more violent crime than New York City.Those numbers are not even per capita.Phoenix at 1/4 the size of New York city usually has more total murders. First, the song, though made famous by Pete Seeger was written by Malvina Reynolds. (She's probably most remembered for writing a lot of Sesame Street songs. ) Ths song Little Boxes was inspired by Daly City California. bannister, Living in the country or a suburb is one of the worst things a person can do for the environment – it cracks me up when people claim they love nature and then live somewhere they have to heat a house and drive 40 minutes to work, and have all their food and other products shipped out to their local Walmart. If you want to help with the population and environment problems you do 3 things: 1) live in the city, 2) have few or no children, 3) reduce or eliminate meat consumption. Or you could just sit around and whine about anyone you see trying to do those things. The trouble is, apartments/"condos" in big cities are even smaller boxes. Best thing I ever did was move to downtown Chicago. Within a year I gave up the car I barely drove. 5 years later I walk everywhere or take public transit, and when I need a car, there's a zip car in almost every garage in the neighborhood, sans parking fees. Its a great way to live after spending 2 hrs a day in traffic or more and obscene gas prices. Housing is more expensive but the trade off in lost time and vehicular expenses makes it worth it. In my opinion, people don't find cars convenient enough anymore, the insurance on them isn't worth the headache, workloads, and the complexity of workloads has made the mental space required to care for a car too annoying to want to upkeep. Move downtown. Live near your work. Work hard. Learn to be at peace with your downtown neighbors. Enjoy the spoils of centralized living where the conveniences of what you really need are all just within' walking distance, or better yet, delivery distance. As a lifelong resident of NYC, I can say that it's a great place to live if you're young or rich. Otherwise, meh. At best. That's why I'm moving out to central NJ. Yeah, it's "boring." But I need space, light, and, frankly, less riffraff around me. Only if you insist on living in Manhattan. That, unfortunately, is really too expensive. Even the most affluent area of the Bronx is easily half the cost of living in Manhattan. There are some nice places in Brooklyn as well, with – And public transportation is great here. This is a wonderful trend. When you think back to the 1970s there was probably only a few Downtowns in all of the country where it was fashionable and safe to live in, San Francisco, New York, Chicago, and maybe Boston. But now you have such a wide range of beautiful Downtowns to choose from Seattle, San Diego, Dallas, Atlanta, and even once unthinkable places like Los Angeles all have beautiful revitalized Downtowns with strong populations. This is just mirroring the Progressive sensibility of many European, Asian, and Canadian cities that have long espoused the excitement of city living. Yes it is probably not for everyone and in reality there are a few negatives like cost, safety, and practicality but it is definitely not a trend but a way of life for the future of America. "Demographers cite gentrification and people's a desire to live closer to their jobs as two main reasons for moving downtown." Not always. There are commuter train lines. Here in metro NYC, we have NJ Transit, Metro North and the LIRR. NJ Transit is practically heaven compared to the NYC subway, much of which is a truly ugly environment. Kevin,I have no idea why UTS and CTS haven't merged, but bucirucraaees are territorial beasts, so it doesn't surprise me to see transportation fiefdoms even in small communities like ours. You bring up an excellent point about the similar tax base on a slice of pizza, but there is a distinct character and commerce in each zone. While I doubt 75 cents will break anyone's resolve to travel between the corner and downtown, the free trolly represents a vision for what could be.I say this because I've heard fantastic things about transportation in Portland, where you can go nearly anywhere in the downtown area for free. This has invigorated commerce in what was once a beleaguered downtown. Free transportation can be used as an engine of commerce, but as you point out, any sane transportation effort can't be done in a house divided.Pragmatically speaking I think any form of public transportation is a good thing, but I'm sure we can make it more efficient. My personal interests are more in line with expanding rail options, but I would entertain working with bus transportation advocates in our area. Does such a group exist? I live in a nice neighborhood in the middle of the city and bike to work. I don't live where I work.